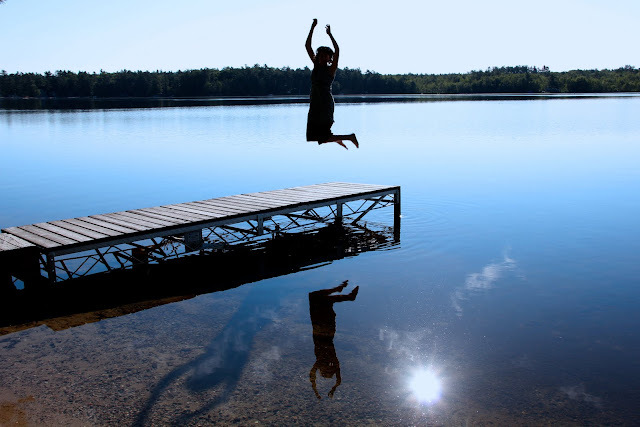 I am jumping for joy that I am guest posting over at Shutter Sisters today! I took this self-portrait a few weeks back when we were vacationing in Maine. I was pleasantly surprised when I saw that I captured my shadow in addition to my reflection on the lake. Don't you just love when those little happy accidents happen in your photographs? I was equally surprised when Tracey Clark recently asked me to do a guest post over at Shutter Sisters. What an honor, thank you Tracey. I hope you will go give me some love over there today dear followers, it would mean so much to me :) Have a wonderful day! 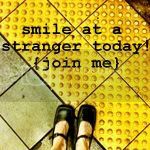 If you are interested in joining me on my smile campaign that I've been blogging about this week, click on the button below for more info! And finally, linking up with the "summertime" theme today at I Should Be Folding Laundry. It's also amazing how still the surface of the lake looks. Wow! Great shot! Congrats on SS! Love this jumping shot! Heading over now to see you. It is great when you find those little extras in an image. Congratulations on SS! Hi! I've stumbled upon your blog through Shutter Sisters and I'm really enjoying it so far. Your photos are inspirational to look at things from a different perspective, I've found myself in a rut with mine and need to shake things up a bit. Lovely self portrait! 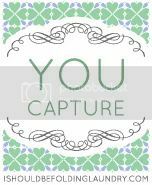 I'm thankful to have found your blog through Shutter Sisters. I'm excited to dive in a little deeper and read more musings and take in your beautiful photography. This is a fantastic catch. I remember when you first started practicing your jumping shots. You're an ace now. Love the photo and your post on Shutter Sisters! glad you get the response and recognition. you deserve it !! bravo ! That is a truly remarkable photograph! Hopping over now! and the sun's reflection to boot! Amazing capture! This is why I love photography - it's moments like these! What an amazing shot!! I just love this. You have become a pro at the jump shot! Loved the SS piece. Congrats! This is so great! Love the colors and contrasts. Not sure how you did it, but you did a nice job on it. Hi Christy, I did a blog post on my personal blog, Tour of No Regrets. How fun is this? Thanks for the inspiration my friend. It epitomises an American summer to me (being Australian). All I can say is HOLY COW that is one awesome shot! So ridiculously proud of you! This is amazing project. Adding your button to my sidebar. i used my tripod and the self-timer built into my camera with a 10 second delay so i had time to run into the photo. i have a remote control but it is broken. i hope this helps. i will try to email this to you too in case you don't come back. thanks for your comment!